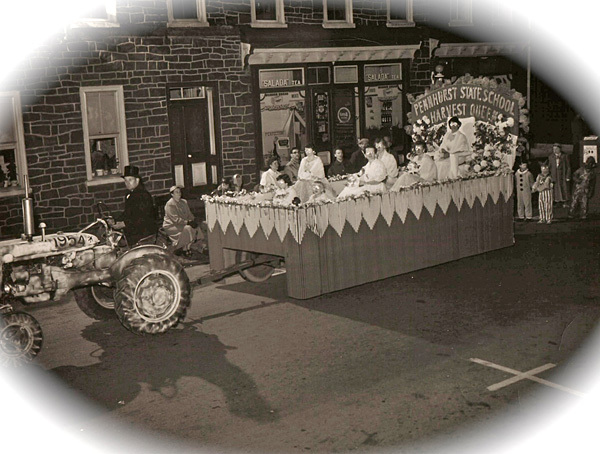 The Pennhurst State School Harvest Queen's Float in the 1954 Halloween parade in Spring City. If you people zoom in, you will clearly see masks on them, and smiles too. ok, if it was all as bad as you women make it out to be, then they most likely WOULDNT have been in a parade.... They would have been in restraints, locked away like they were when it shut down. Maybe the eyes where just blacked out by the photographer.To keep these people's ID hidden?! @Melissa - I'm sure the eyewear is just part of a costume. Patients would not have been paraded about with blinders on And Johnny in Suffer The Children was masked only to hide his identity on TV. I think the mask over the eyes isn't for Halloween, but to deliberately keep them from seeing others in normal society. A similar eye covering is shown worn by the boy John during his interview for NBC's Suffer the Children. If you look closely some of them appear to be wearing masks, or some time of disguise glasses. This was Halloween parade after all, but not all of them have white eyes, try to look closer. UMMMM WHY are all their EYES WHITE?? AND GLOWING???? ?